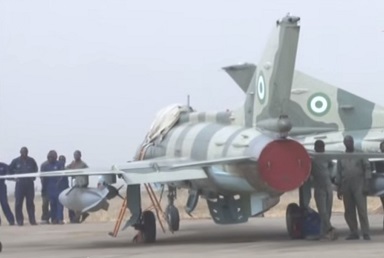 The Chief of Air Staff, Air Marshal Adesola Amosu, has said the Nigerian Air Force has lived up to billing in the ongoing counter insurgency operation in Northeastern Nigeria. Amosu, who made this known at a press briefing Thursday to mark the 51st anniversary of the Nigerian Air Force, said recent new acquisitions and upgrades in its inventory assisted in the ongoing rescue operations in Borno State. He said, “We have been able to receive the twin air 350, which is essentially for tactical transportation to support the ongoing counter terrorism operations. “We got the MI24 which we duly upgraded to MI35, for the operations in the Northeast, just as we got the UAV, and our UAV’s are weaponized. We conduct strike activities with the UAVs now. “We also have the diamond aircraft for training and surveillance. We are able to secure the Haris Radio, of course communication is very important for any operation and we have secured the Harris 7850 radio”. The Air Chief, however, said more is required to put the service in good stead in order to tackle the situation effectively, adding that more funds are required to ensure combat readiness. He stated that a good number of the aircraft needed for surveillance and attack have been put in shape, but more efforts were required to reactivate grounded ones for optimal performance by officers and men. “The reactivation effort as a strategy will ensure that a minimum of three C130s are available at any given time, the rest of them we carry out conservation to ensure that when its time and the funds are available we can quickly wake them up. “The super puma before now they were not flying, two of them are flying now. The Dornier 228 and we had to send the engines out, so that we can have minimum of three Dorniers at any given time”, he added. Is Diego Costa Disrupting Chelsea’s Transfer Plans?